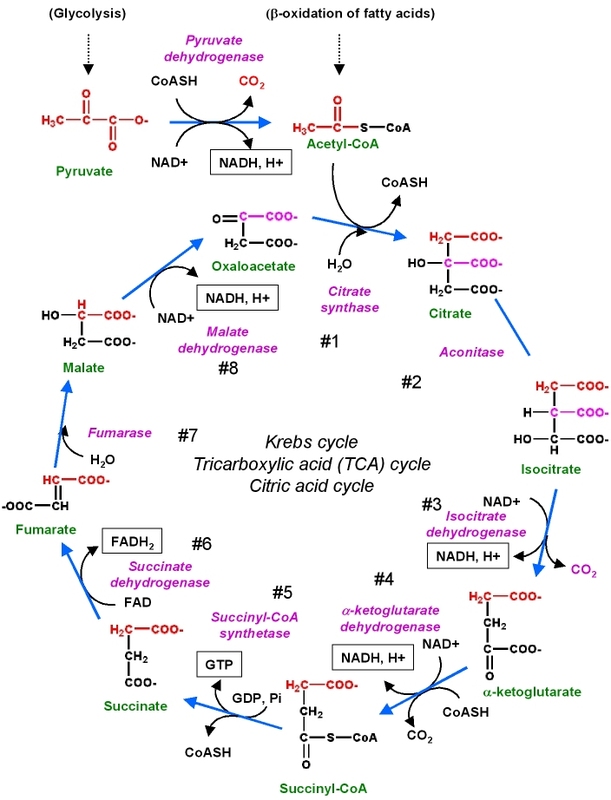 The citric acid cycle, also known as the Krebs cycle or tricarboxylic acid (TCA) cycle, is the second stage of cellular respiration. This cycle is catalyzed by several enzymes and is named in honor of the British scientist Hans Krebs who identified the series of steps involved in the citric acid cycle. The usable energy found in the carbohydrates, proteins, and fats we eat is released mainly through the citric acid cycle. Although the citric acid cycle does not use oxygen directly, it works only when oxygen is present. The first reaction of the cycle is the condensation of acetyl-CoA with oxaloacetate to form citrate, catalyzed by citrate synthase. Once oxaloacetate is joined with acetyl-CoA, a water molecule attacks the acetyl leading to the release of coenzyme A from the complex. In this reaction, a water molecule is removed from the citric acid and then put back on in another location. The overall effect of this conversion is that the –OH group is moved from the 3′ to the 4′ position on the molecule. This transformation yields the molecule isocitrate. In the third step, isocitrate is oxidized and releases a molecule of carbon dioxide, leaving behind a five-carbon molecule—α-keto glutarate. The enzyme catalyzing this step, isocitrate dehydrogenase, is important in regulating the speed of the citric acid cycle. Alpha ketoglutarate is converted to the 4-carbon succinyl CoA. A molecule of CO2 is removed and NAD+ is reduced to NADH + H+ in the process. Enzyme: alpha ketoglutarate dehydrogenase. The enzyme succinyl-CoA synthetase catalyzes the fifth reaction of the citric acid cycle. In this step a molecule of guanosine triphosphate (GTP) is synthesized. The four-carbon molecule produced in this step is called succinate. In step six, succinate is oxidized, forming another four-carbon molecule called fumarate. In step seven, water is added to the four-carbon molecule fumarate, converting it into another four-carbon molecule called malate. Malate is oxidized to produce oxaloacetate, the starting compound of the citric acid cycle by malate dehydrogenase. During this oxidation, NAD+ is reduced to NADH + H+.